This is a continuation of my series on building the first two tiers of a proposed 3-level outdoor railroad, using more lumber than dirt. From the start, I planned to have a multiple-tier water feature, with waterfalls that the trains ran past and ponds the trains crossed over. Though planning for the water feature has been ongoing for months, the first article dedicated to its construction is here. 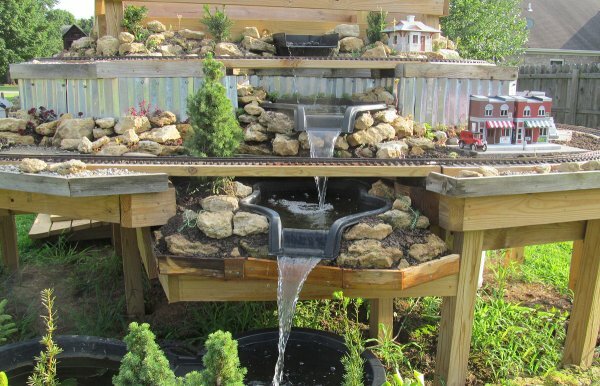 At the end of that article - as shown to the right - I had installed and dirtscaped the top two layers of the water feature, a weir (spillway) and a Maccourt connecting pond that would spill into the next level. I had also jury-rigged a third level that would get a second Maccourt connecting pond once it was decked out. Again, the places that sell preformed ponds act like all you have to do is scrape dirt in the right places, line these things up, and throw some Hostas into the ground. But for a complex water feature, you need to make certain your pieces are supported properly, even if you will hide those supports once the pieces are all doing what they're supposed to do. Because I wanted to put rocks and dirt and plants on this layer, too, I added some scrap lumber pieces around the new frame to keep the dirt where it was supposed to go and started decking. In the photo to the right, the red ovals show some of the boards I used to close up the back and sides of the little deck. 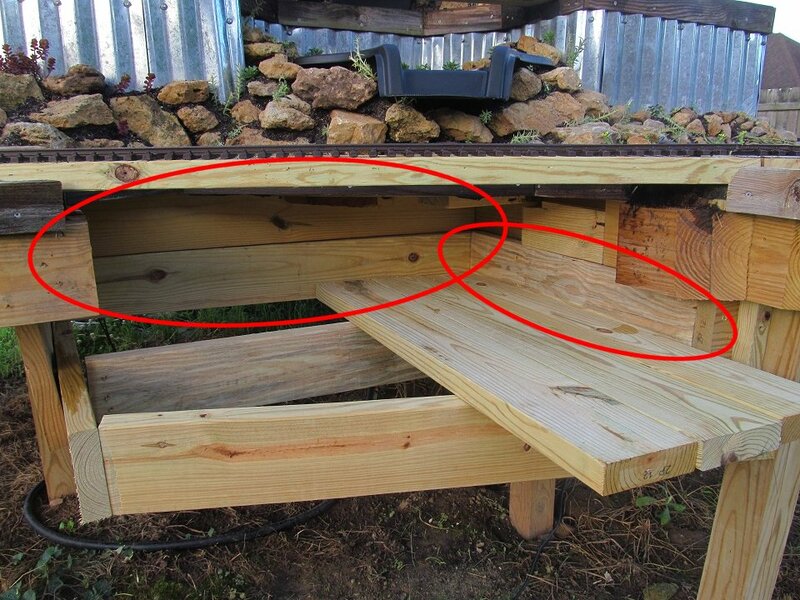 When the decking is finished, you won't be able to see through that layer. And it will allow me to pile dirt several inches deep around the connecting pool, for plants. I cut the decking boards a little larger than they will need to be, because I wanted to test that connecting pool's final placement before I trimmed them off. 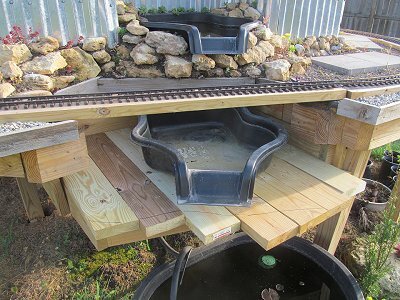 In the meantime, I went shopping for a water tank or trough I could use for this level to drain into. 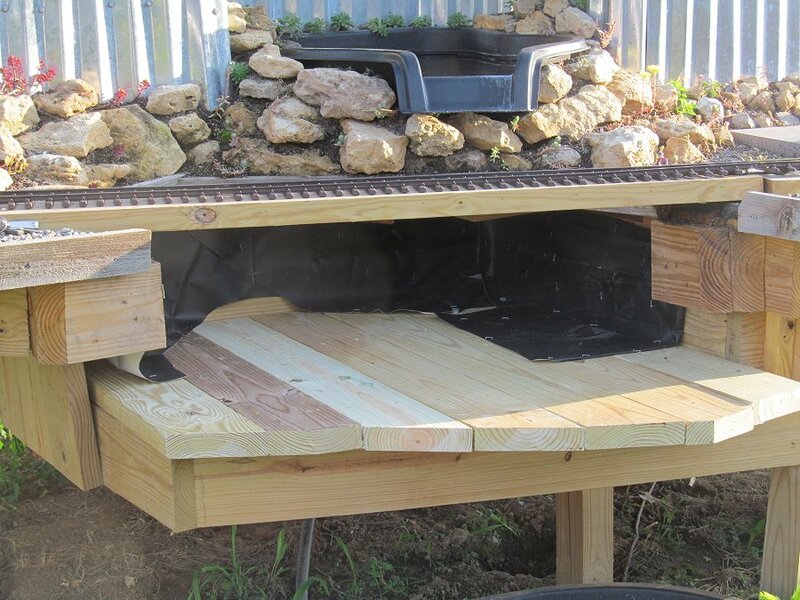 I had thought of getting a galvanized horse trough or some such, but they're not cheap, and no good used ones came available while I was in the planning phase. 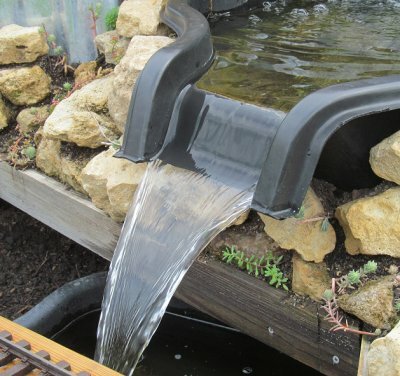 Eventually I bought a "utility tank" for half price at our local pond supply and positioned it so that the water from the second Maccourt connecting pond would drain into it. In part this was to check the position of the Maccourt connecting pond, and in part this allowed me to get the waterfall started. The photo to the right shows one of my "tests." The utility tank is camouflaged by potted trees in this photo, but you can see it more clearly below. This will probably be replaced next year, when I (hopefully) install the next layer of railroad, but it will give me a chance to run the waterfall and get some pond plants started in the meantime. You can see that this photo was taken when I was just beginning the process described in our article "Adding a Train Shed Part 1". In fact, the waterfall stayed in about this configuration until I had gotten the rafters of my train shed raised, as described in "Adding a Train Shed Part 1". 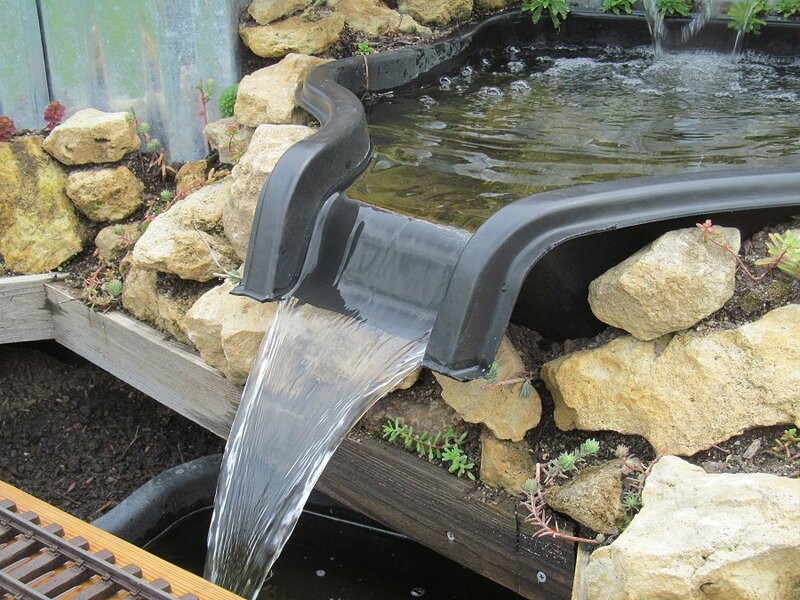 Choosing a Pond Pump - In the meantime, I priced many pond and waterfall pumps. 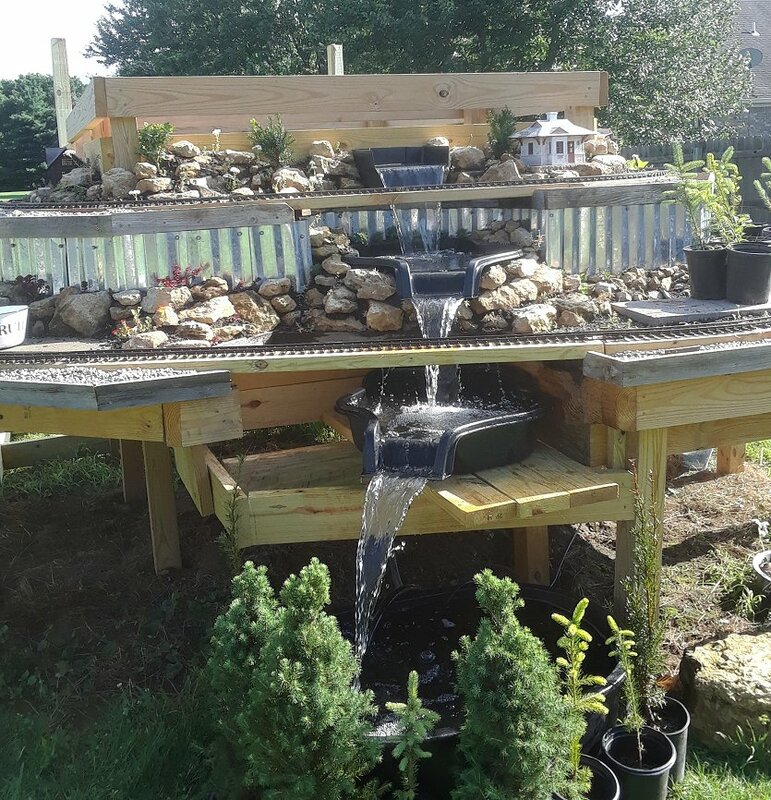 In evaluating the pumps available to me, I tried to keep in mind that the top of the waterfall could conceivably be seven feet above the pump in the thing's final configuration (right now it's about 5 1/2' because the "pond" isn't actually in the ground). Most fountain, pond, and waterfall pumps' documentation tells how far they can be expected to raise a column of water before they give out. For me, at this level, there seemed to be a gap between the "not quite enough" and the "too much" pumps. I finally bought a Pondmaster "Pond-Mag," 9.5. Rating-wise, it was on the lower end of "too much," and there was a rebate that made it about the same as the "not quite enough" pumps. The photo also shows the netting from a vegetable bag tied over the "prefilter" that comes with the pump. That was to keep the little tiny goldfish I bought from getting sucked into it. At this stage, the goldfish are more-or-less "canaries in the coal mine." They eat mosquito larvae, which is critical, but while you're getting the kinks worked out of your water feature, they may not survive. So don't start out with $40 Koi or even $7 Comets. A healthy .39 Comet will grow quickly in a healthy pond. About "Algae Bloom" - The pond water turned green up in record time. This is called "algae bloom" and happens quickly in untreated ponds. It may also come back after heavy rains change the chemistry of the water in your pond. Single-cell green plants turn the water into pea soup. You can see some of the algae forming over the pump if you click on the big photo. I bought some algaecide, making certain it was safe for other pond plants (some of them - meant for drainage ponds or the like - kill most or all pond plants). By the way, you can buy fancy filters that bombard the water they filter with ultraviolet light, killing the algae as it passes through. That's not a bad idea, really, but I've always found a few doses a year of a good algaecide worked for me at a fraction of the cost. Water Lily Starts - I also bought some water lily starters that came in a cardboard box from Lowes. As far as I can tell, they're bits of water lily roots packed in peat moss wrapped in netting. You drop them in the pond and cross your fingers. Save your receipt, especially if you buy them late in the season like I did - only about 2 out of 3 ever come to anything. It might seem silly to get water lilies started before there is even - technically - a pond, but they help establish an ecosystem that is healthy for the overall water feature. Goldfish eat mosquito larvae and fertilize the water lilies. The water lilies absorb some of the ammonia from the goldfish and give them a place to hide when they're nervous (that actually makes them more bold overall). They also make it harder for the raccoons and neighborhood cats to catch them. Once you have water lilies started at all, they spread, especially if you fertilize them or have a lot of fish. In a healthy pond, they may need divided within two or three years. So spending a few dollars early to get them started is actually better than spending a lot of money later to get the same effect. About Starting Gold Fish - By the way, do not take your children or grandchildren with you when you buy goldfish for a new pond. 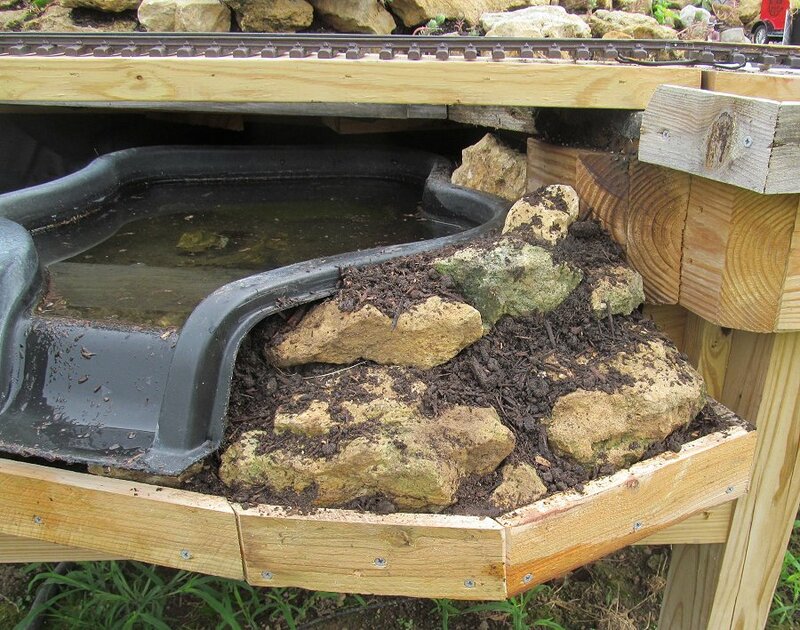 The chances of your first batch surviving is pretty low, since you may have to flush or treat your new water features multiple times until you get the bugs worked out. Whatever you do, do not let your children or grandchildren name the goldfish. Try to buy inexpensive, but healthy-looking goldfish. Look for goldfish that have "perky-looking" fins even when they're not being chased around the tank by a store employee's net. By the way, I always ask the store employees to let me net them myself. I can locate a nice, healthy-looking fish and keep track of him until he's safely netted. Even dying goldfish look "perky" when they're scared, so the store employee will just snag any old fish, even one that was all but belly-up a minute earlier. Of course, I used to raise tropical fish, so I have more experience at this sort of thing than the average garden railroader. Try to get them into your pond quickly - an hour in the bag may be too long. Twenty minutes in the bag in a hot car may be too long. Put the bag into the pond as soon as you get home, so the water temperature in the bag can adjust to the water temperature in the pond. Then, after a few minutes, unclasp the top of the bag, hold the opening tight with one hand, and turn the bag upside down. Put the end with the opening in the water. When the goldfish are at the lowest part of the bag, let it open gently, so that they spill into the water without getting caught in the plastic. Then say goodbye to them. If they have ANY place to hide, you won't see them again until they start feeling confident in their new environment. If your pond is shallow, and they have no place to hide, and you have a good population of raccoons in the neighborhood, you may not see them again period. The only reason to feed goldfish in an established pond is to get them to come toward you when you feed them. At first, you might want to feed them a little, just a pinch at a time. I've always had great luck training fish to come to me to be fed indoors, but not so much outdoors. And do I really want the fish so used to responding to vibrations that they come to the top when the raccoons come to forage or the foxes come to drink? 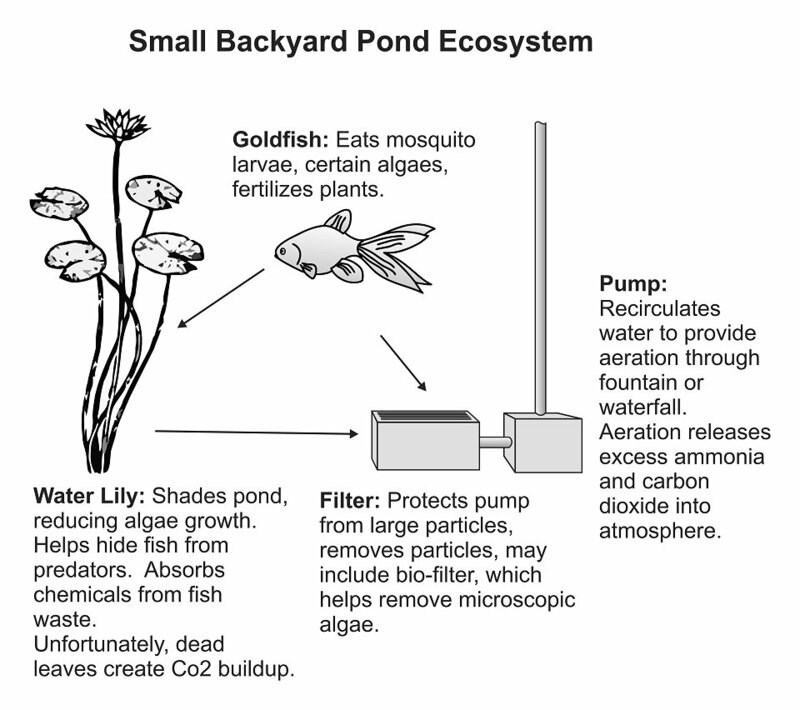 Once the pond ecosystem is well established, you won't need to feed your goldfish at all - they're survive on mosquito larvae and certain kinds of algae. I know it seems like I'm backtracking, but I had to have the utility tank in a good place to receive water before I was certain that the second Maccort pond was in the best position. I tested the interaction of the various waterfall pieces by filling the utility tank with water, hooking the pump up to the hose I ran earlier, and letting her rip. The photo to the right shows the platform the second Maccourt connecting pond will be sitting on, with marks showing where I would trim. I screwed the 2"x6"s in place, then covered the utility tank with a tarp and used my circular saw to trim the edges. No matter how I moved the second Maccourt connecting pond around, it sat so high above the utility tank that the falling water really churned up the water in the tank. In a 200-gallon pond, this wouldn't be so much of a problem. But in the meantime my goldfish were being traumatized by the "whitewater" - I'm sure they were hearing banjo music. After trying several adjustments, I sprung for another fixture that was theoretically designed to fit inside whiskey barrels. It had a nice spillway, so I figured I could let the water from the second Maccourt pond dump furiously into this fixture, and then have a nice 5" or so drop from this fixture to the utility pool. I had to half-empty the utility tank to move it out of the way. Then I used some scrap, pressure-treated lumber to level the new fixture (more or less). The water spilling into my "main" tank now was much less violent. And rather than the goldfish freaking out every time the pump came on, they swam over to where the water was coming in - a normal feeding practice. The "prefilter" that came with the pump was meant to keep big things from going into the pump mechanism - it had nothing at all to do with cleaning the pond's water. At the old house, I had a shoe-box-shaped filter that included two filter pads and room for "bio-media" (described below). I shopped for one of those and the first several I came across were in the $70-$90 range. In the meantime, I tried to get by with a little rectangular foam filter that just stuck onto the end of the pump's intake (shown right). It was somewhat coarse, though, and dust-sized bits, such as dead algae from treating algae bloom, were still going through the system unhindered. When you have - essentially - a 60-gallon system with a pump that will easily handle ten times that, and it takes several days to clear the pond's water, that's not adequate. Eventually I found a TetraPond "flatbox" filter on Amazon for a good price. Later I found a filter identical to the one I had used before here for about $12 more. The second one may have served a little better, but the TetraPond "flatbox" will work great for my purposes for now. Here's a warning about these things. 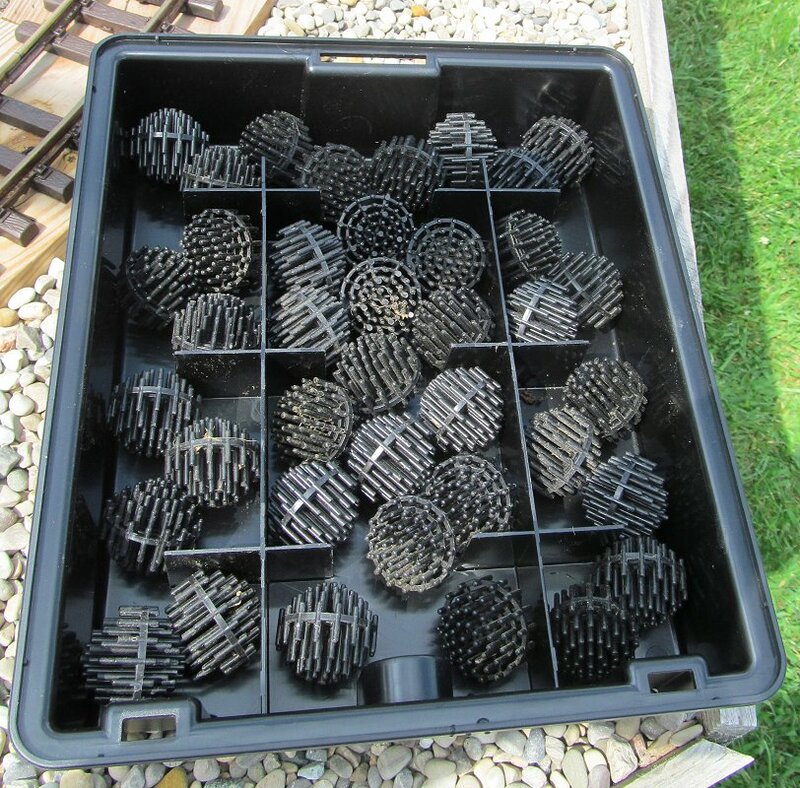 BOTH of these filters, and a dozen similar ones vary widely in price. The Tetrapond filter I wound up purchasing for about $17 could have cost me as much as $60 from other online sites or brick-and-mortar pet stores. 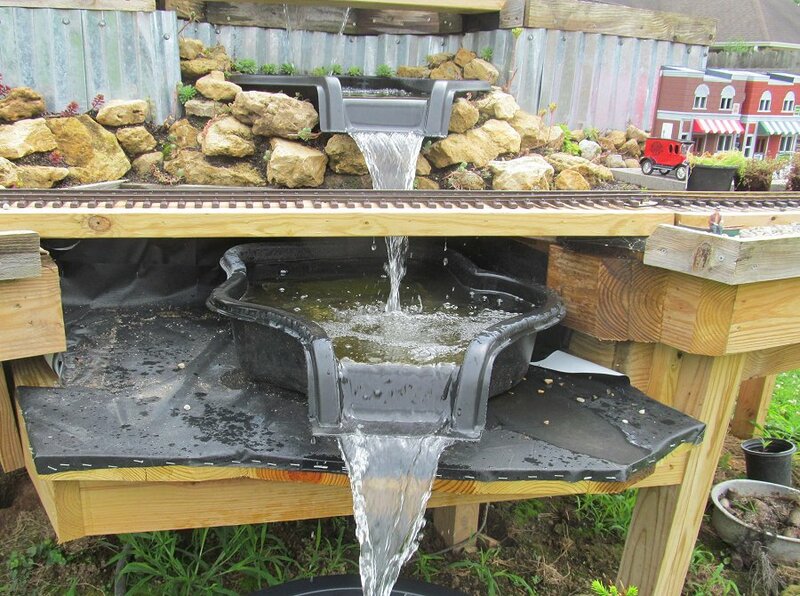 The Tetrapond flatbox filter said it was for ponds up to 500 gallons, but would handle pumps that would deliver up to 2,000 gallons per hour. To me that sounded a little contradictory, so I contacted the manufacturer and verified that the filter would work with my pump before I ordered one. 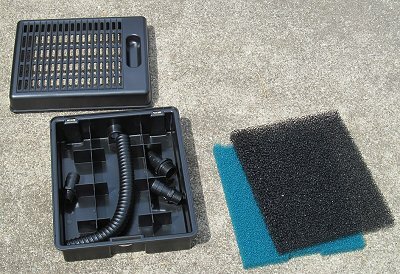 The components of the Tetrapond Flatbox filter are shown to the right. 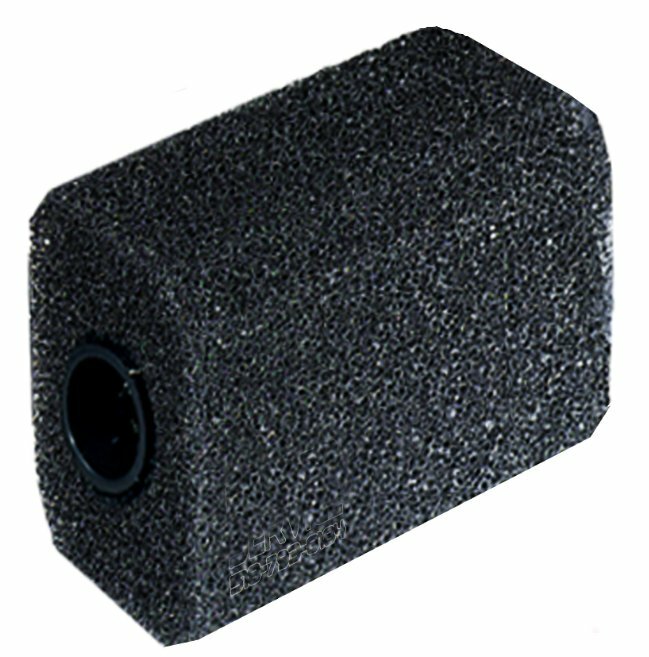 The black plastic shell comes with a hose and connectors for attaching to your pump. It also comes with two filter "media," one coarse and one relatively fine. The little adapters were helpful, but I had to return to my local pond supply store and buy another one to hook the hose to my pump. Below the place where the filter media would sit was a cavity where I could add some "biofilter media." That term defines anything that presents a lot of surface for helpful bacteria to form. These bacteria, which live in the dark, eat algae, so that's a good thing. I had bought some "biomedia" balls earlier from my pond supply when I had considered making the weir at the top of my waterfall into a filter. About half of the bag fit into the lower chamber of the filter box. 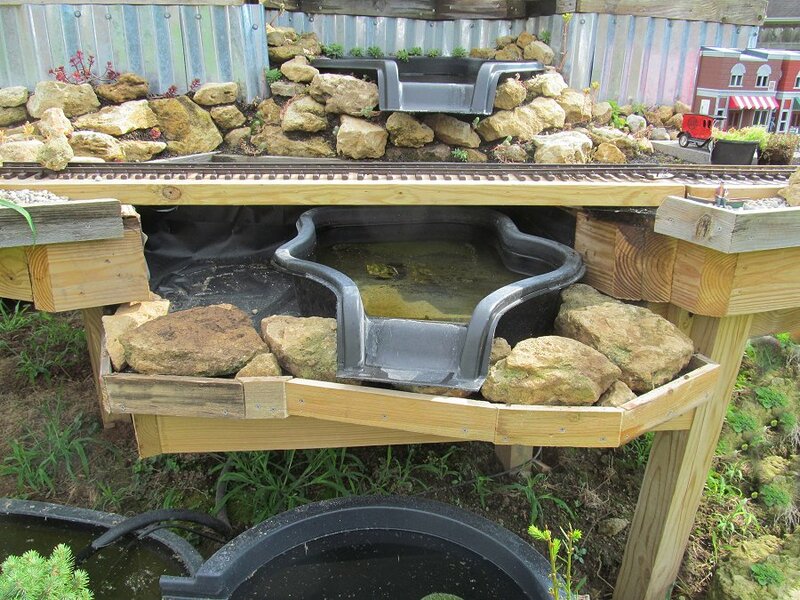 Once I had the box assembled and attached to my pump, I lowered them both into the utility tank that is serving as my pond, being careful not to smash any goldfish. I expect the filter to be useful even if and when I install a much larger "pond." 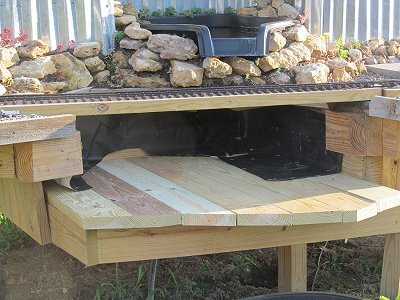 Once I had the edge of the supporting mini-deck trimmed the way I wanted, I added vinyl to keep the dirt I was going to use from resting directly against the timber. Yes, the 2"x6" pieces I used were "ground-rated," but why tempt fate? Once again, the vinyl was from a piece of billboard vinyl I ordered for a fraction of what roofing or pool lining vinyl would have cost. This piece happened to be in perfect condition, but for this use it wouldn't have to be, in case you're considering saving money the same way. 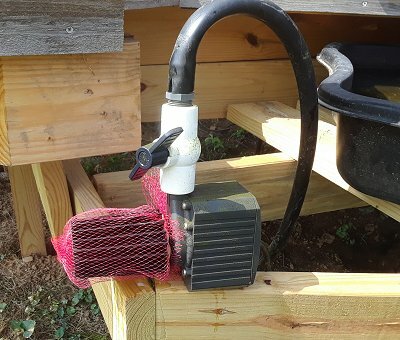 When I had to stop working on this to pay attention to other things, I made certain to run the pump a little every day to keep the water clear and the pond aerated. This also allowed me to test the final position of the second Maccourt connecting pool before I embedded it in rocks and dirt. The photo to the right shows the rest of the vinyl stapled down and the pump running. By now, I realized that this broader platform would give me more room to plant things, maybe even more little trees and shrubs. Test Run for Visitors - Just after I had the vinyl in place at this level, we entertained visitors from out of town. I put two trains on the track and started the pump for the waterfall. While it was running, I took a short video with my cell phone. If you want to see that, click on the picture below and wait a minute or three (depending on the speed of your internet connection). A side note to my model railroading friends who don't like trains "just" running in circles - I'm planning another level beneath these that will have more room for the trains to operate. In the meantime, the visitors we've had so far have quite enjoyed what they see here. Back to the dirtscaping: To hold the dirt back - as I had on the upper levels, I split some pieces of pressure-treated dog-eared fence boards and cut them to fit the odd shape of this level's deck. Yes, I realize that this isn't prototypical, but the truth is, since I'm consistently using the same material, visitors don't really notice it after the first minute or so. These are dogeared planks, listed as 1"x6"x6', but they're technically more like 5/8" x 5 1/2" x 6'. Split in half, they're about 2 3/4" inches wide. Some of these pieces don't look as weathered as the ones I used earlier because they weren't as exposed when I was storing them. However, they should gray up quickly, based on my previous experience with this material. During this stage, I had to remind myself why I didn't just cut a couple straight lines - I wanted the edge of the decking to come as far out under the lip of the Maccourt pool as possible, without being exactly in the "splash zone." That way I could bring the rocks, dirt, and plants up around the pool lip better than I had on the upper levels. The photo to the right shows the trim boards, as well as the first layer of rocks I installed to hold the dirt that will be filling most of the vacant space around the fixture in place. 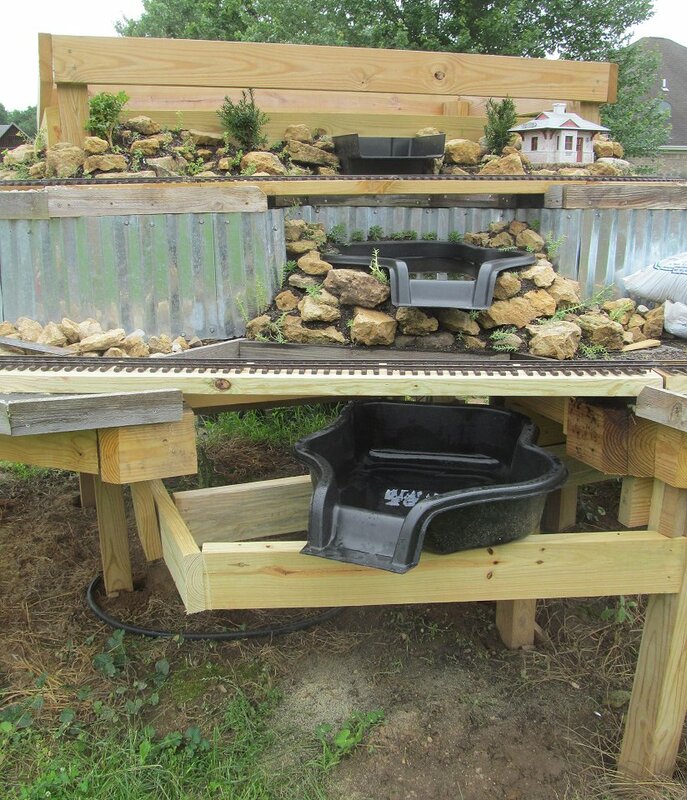 As I did on the top two levels, I put dirt between the levels of the stones like mortar - not to hold them in place so much as to provide a cool place for the roots of the sedums and other plants I intended to put there. I also poured and packed dirt behind the pond - even in places where plants couldn't possibly grow. That way the roots of anything I plant on this layer will have more room to spread. Also, leaving large cavities around pond fixtures encourages rodent settlement there. Don't ask me how I know. While installing the dirt, of course, I did get some into the water fixture. I "solved" that problem by turning the pump back on so anything floating on the top would work its way to the "big" pond. Then I flooded the big pond just enough so that the "floaters" from this step, plus the sawdust from the board-trimming step would seep out over the edge. If your pond is completely submerged in the ground, you'll have to use a net, I suppose. Adjusting the Flow of the Second Layer - In the meantime, the "bridge" of the second layer of the railroad was occasionally getting splashed by the first Maccourt connecting pond I placed there. The thing's lip was apparently designed to shoot water far out and away from the fixture. I had trimmed the little lip back somewhat already, but at this point, I realized a bigger cut would be necessary. With a utility knife, I cut the lip back until it is barely a lip. The water still shoots out somewhat, but not nearly as far or as forcefully as it did before. If you compare this picture to the photo of the other, unmodified Maccourt pond just above, you'll see how much I carved away. Third Layer Dirtscaped - The photo below shows the first three layers of the waterfall, counting from the top down. Since the dirt around the second Maccourt pond was six inches deep and over a foot wide, I thought it might support a small Dwarf Alberta Spruce. The one I used was rootbound, and had a less-than perfect growth pattern, but I got it for half-price at a Walmart when I went in for something else, and I thought it would be a useful experiment. If it survives and gets too big, I'll replace it with a smaller one next spring. In the meantime, it helps the whole scene look just a little more organic, don't you think? I have other plants to transplant here, but it will be a few days, and I wanted to get a photo now. As this project starts looking less like a pole barn frame and more like a railroad and garden, folks have been very encouraging. 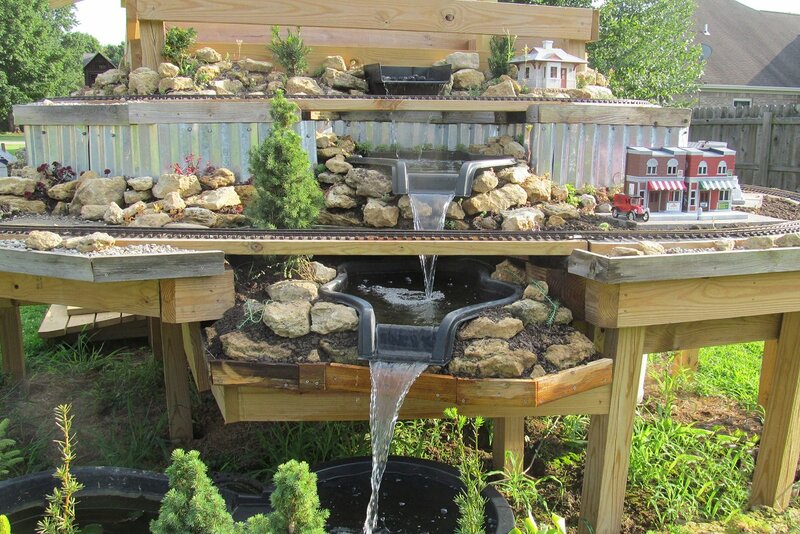 Next year I hope to add something that's a little more like an actual pond for the waterfall to spill into. But in the meantime, it's a lot of fun to see and hear the water rushing, especially when there are trains on the track as well. This article has been WAY longer than most of them, but I wanted to show you every step I'm going through, even the mistakes I made. Hopefully seeing such details will encourage other folks to try something like this. And probably do it better, to be honest. But that's why I share. The next article will go back to the shed construction, as it's important to get the shed "under roof," as they say, before I do some of the other things I hope to get done before winter this year. 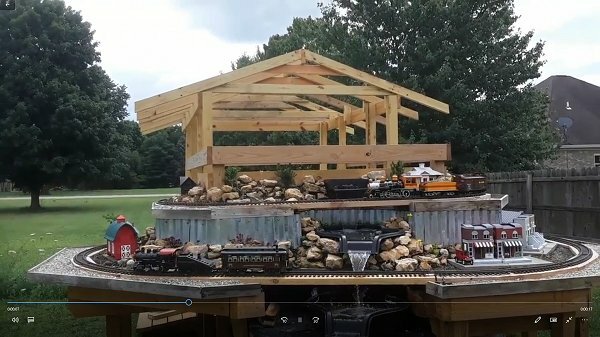 As always, if I've helped you get any ideas at all for your next garden railroad construction, I will consider the time it took to document all of this time well spent. Enjoy your hobbies, and especially enjoy any time you can spend with your family in the coming season. Proceed to "Adding a Train Shed Part 3" - Adding fascia, sheathing, and end trim to the in-progress train shed. I thought about bringing in helpers for this part, but a reader commented on how helpful it was to see how one person could do this sort of thing by himself, so I just kept plugging away. Return to "Adding a Train Shed Part 2" - Adding rafters to the frame of the in-progress train shed. Now it's starting to look like it might actually be a structure and not just a crazy collection of posts. The way we got the rafters and ridge board up wouldn't work for everybody, but it worked for us, and hopefully will help other folks to "think outside the box" - literally in this case. Click on the photo to see our progress as of July 14, 2018. 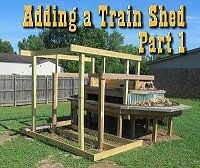 Return to "Adding a Train Shed Part 1" - What started out as a simple addition of a deck to stand on when putting trains on the track got a little more ambitious when I realized that JUST installing the deck this year would require more work next year. So we framed out what we planned to be a train shed attached to the railroad. If it ever gets finished, I can easily put trains on the track at a moment's notice instead of schlepping them out from the garage. Click on the photo to see our status as of July 9, 2018. 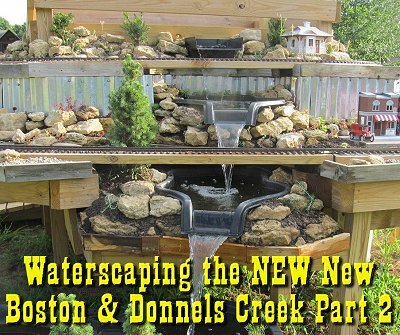 Return to "Waterscaping the NEW New Boston and Donnels Creek Part 1," our article on getting the top two layers of the waterfall on solid footing and getting the third layer framed. After we finish decking and dirtscaping the third layer, we will probably add a washbasin or something for the water to flow into, then add a pump to get the waterfall flowing. No big pond until next year at least - too many other projects. Click on the photo to see our progress as of June 13, 2018. Return to "Dirtscaping the NEW New Boston and Donnels Creek RR, Part 2. - Adding barriers to keep the rocks, dirt, and plants where they're supposed to go, placing platforms and running wiring for buildings, adding rocks, dirt, and plants to the upper level of the railroad. Click on the photo to see our status as of June 1, 2018. Return to "Adding Raised Roadbed to the NEW New Boston and Donnels Creek, Part 2" - Trimming the corners off the roadbed on the upper layer and cutting the pieces that will support the curves on the middle layer. We need to get the upper two tiers of the pond installed before we totally complete this step, so the article doesn't quite show the finished product. You'll see it later as part of other articles. Return to "Adding Raised Roadbed to the NEW New Boston and Donnels Creek RR, Part 1" - Sorting out our priorities for the spring and summer of 2018. There a lot of little chores we really should get done before we start on the next big addition. Click to see our plans as of February 27, 2018. Return to "2018: Springing into Spring on the NEW New Boston & Donnels Creek RR." - Sorting out our priorities for the spring and summer of 2018. There a lot of little chores we really should get done before we start on the next big addition. Click to see our plans as of February 27, 2018. Return to "Dirtscaping the NEW New Boston and Donnels Creek RR, Part 1. - Putting edging around the existing "layers" of the new railroad, and beginning to add gravel and rocks. There were a few test runs, but we got stopped early by bad weather before we could dump the rest of the rocks, gravel, and dirt, much less plant the plants we hoped to get in before snowfall. Return to "Decking the NEW New Boston and Donnels Creek RR - Decking the 'middle layer' of our proposed three-tier outdoor railroad. Prepping more track, laying out track and decking to make certain we have measurements correct, installing most of the remaining decking for this layer. Return to "Framing the NEW New Boston and Donnels Creek RR, Part 6" - Modifying and finishing the framing on the second layer, cantilevering, using R3 track versus all other pre-curved track formats, finalizing the track plan, why painting the track makes old and new track blend better, and more. This will be the last bit of "framing" in 2017, and it worked out well, considering. Return to "Framing the NEW New Boston and Donnels Creek RR, Part 5" - Spreading the billboard-sourced vinyl underlayment on the top layer. Prepping used Aristo track for (hopefully) many more years of service. Laying the first loop of track, attaching power wires with spade terminals, and testing conductivity with a Bachmann streetcar. Return to "Framing the NEW New Boston and Donnels Creek RR, Part 4" - Planning and running the decking for the top layer, testing the track plan, checking clearances, prepping used track with new railjoiners, examining the vinyl I ordered to go over the decking, and more. Return to "Framing the NEW New Boston and Donnels Creek RR, Part 3" - Getting the frame finished on the top layer, ordering other things I'd need eventually, deciding on materials for the decking on the top layer (at least). Return to "Framing the NEW New Boston and Donnels Creek RR, Part 2" - Once I had the overall frame relatively solid, I hooked up the underground power lines to two GFI plugs that should be in easy reach once everything is finished. I also decided to frame out the top railroad layer while I could still access the center of the railroad easily. Because I was running out of vertical space, I reconfigured that layer. Then after I got the "core" pieces on, I changed my plan again. But the whole thing is getting easier and easier to visualize, and is getting closer to complete with every board I cut and fasten on. 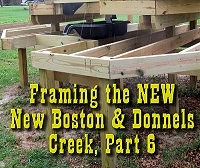 Return to "Framing the NEW New Boston and Donnels Creek RR, Part 1" - Once I started dropping posts in the holes and screwing things together, I didn't want to stop before I had the basic frame built (for one thing, the wood warps less once it's fastened in place). Now the folks driving down the street past our house (we're on a corner lot) probably wonder if I'm building an elaborate chicken coop, but that's fine with me. I still need to make a few more lumber runs and do a lot more cutting and sawing, but having the basic frame in place should make the next bits a lot easier. Return to "Breaking Ground on the NEW New Boston and Donnels Creek" - Okay, in case you wondered if we'd ever get started on the thing, we broke ground in July, using a manual post-hole digger. Well two manual post-hole diggers. But by the end of this article, we're ready for the posts to start going in. Return to "Planning the NEW New Boston and Donnels Creek, Part 4" - Well, the rented post-hole digger fell through, so we dug our vegetable garden with a manual post-hole digger (the scissors kind). In addition, I stake out where the railroad was going to be. Twice. And tweaked the plans again. Sorry about the redo's, but sometimes just walking around the yard trying to visualize things makes me reconsider something that seemed "settled" only a few days before. 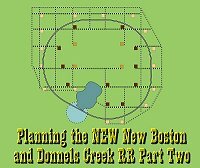 Return to "Planning the NEW New Boston and Donnels Creek, Part 3" - We have still not broken ground. In part because we plan to rent a post-hole digger and dig the post holes for our raised vegetable garden and the first phase of the garden railroad at the same time, and we don't have enough lumber on hand yet. (If we didn't break it down into multiple trips, we'd be blowing out the shocks on our minivan.) In the meantime, we used a line level to see if the slope of the back yard was as bad as we thought it was (it's worse), and we did other site preparation, including planting a whole bunch of spruce tree seedlings to eventually give us some privacy in our side and back yard. Plus, I'm still wavering a little on the "where-to-start-first" issue. Return to "Planning the NEW New Boston and Donnels Creek, Part 2" - More plans. We've moved on from the 2"x6" roadbed-on-posts to a sort of "train-table-outside" plan. Our goals include low-maintenance, high interest, and high reliability. We're also trying to get around having a thousand dollars' worth of dirt hauled into the back yard. If you want to get some idea of what our planning process looks like, reading these through in sequence may help. Or it may drive you crazy. 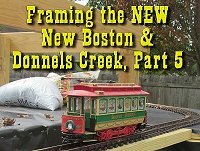 Return to "Planning the NEW New Boston and Donnels Creek, Part 1" - If you're subscribed to our newsletter, you know that we moved just after Thanksgiving in 2016, leaving behind most of the track, a few of the bird feeders, and one Bachmann train set for the new owners. We also left behind a high-maintenance garden that we do not intend to replicate at the new place. This is the first chapter of a new chapter in our lives, which we hope will include a lot of "lessons learned." But first, some serious landscaping had to take place. 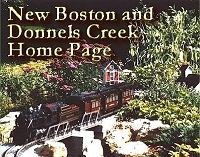 Return to the New Boston and Donnels Creek RR Page - This is the page describing Paul Race's progress and frequent rework on his own garden railroad, started on a shoe-string budget in 1998, later expanded, and later refurbished several times as issues arose. Issues that Paul hopes to avoid by building the next iteration above ground. Click on the photo to see the home page of Paul's railroad. 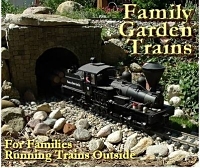 Return to Family Garden Trains' Home Page - The home page with links to all the other stuff, including design guidelines, construction techniques, structure tips, free graphics, and more. Paul D. Race. Reuse or republication without prior written permission is specifically forbidden.